Gabon's President Ali Bongo arrived in Libreville overnight on Tuesday following several months of absence after suffering a stroke, just over a week after the country experienced an attempted coup d'etat. Bongo returned from Morocco to preside over a ceremony for the swearing-in of a new government. He is expected to return to Rabat shortly to continue his hospital treatment. "The president of the republic is present in Libreville," said Alain-Claude Bilie-By-Nzé, in an interview with Deutsche Welle radio. Bilie-By-Nzé said it was "out of the question" that Bongo swear in the new government from abroad and when asked if Bongo would be returning to Morocco he said, "certainly, he hasn't yet finished his convalescence". Gabon has been without its head of state for several months. Bongo is thought to have suffered a stroke during a visit to Saudi Arabia in October and received initial treatment in Riyadh. He was then transferred to Morocco to continue his recovery and has since made rare video appearances including a speech for New Year. The Gabonese president's return comes just over a week after a foiled coup attempt by a group of soldiers who seized the country's state broadcaster. The apparent coup leader gave an address describing Bongo's New Year speech as "shameful", saying Gabon had "lost its dignity". Tuesday morning's swearing-in was closed to the press, according to reports from the AFP news agency. Almost 40 government ministers were sworn in during a ceremony presided over by Bongo at the beachside presidential palace in Libreville. 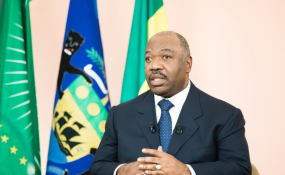 "The Gabonese presidential protocol obviously chose a discrete return for President Ali Bongo," reported RFI's Libreville correspondent Yves-Laurent Goma. A new government was announced in a video from Rabat on Saturday, though there were no significant changes. Gabon's constitution states that before taking up their roles members of the government must take an oath of office before the president and in the presence of the constitutional court. Bongo is expected to chair a cabinet meeting before returning to Morocco to continue his recovery.